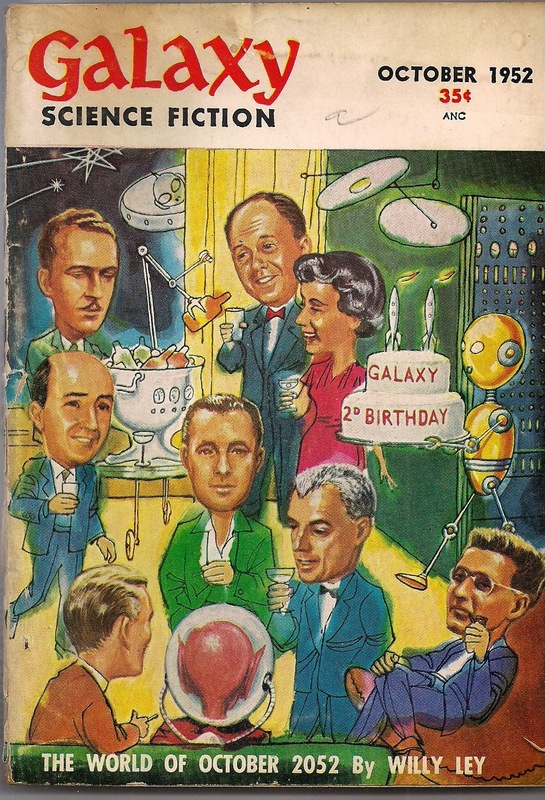 The below wraparound cover painting by Ed Emsh (Emshwiller) portrays an imaginary 1952 party held on the second year anniversary of Galaxy magazine to celebrate its meteoric rise to prominence. 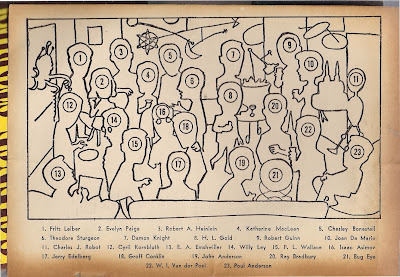 Pictured on the right side of the front panel about half way down, walking through the party a glass in hand, is the genial host and Galaxy's ingenious editor, H. L. Gold. He is surrounded by the cream of the magazine's contributors. Above him on the left side of the robot beer serving device is Damon Knight, and across from Knight, on the right being served by a robotic arm is Robert Guinn, the magazine's canny publisher; standing next to him is Joan De Mario, its production manager. 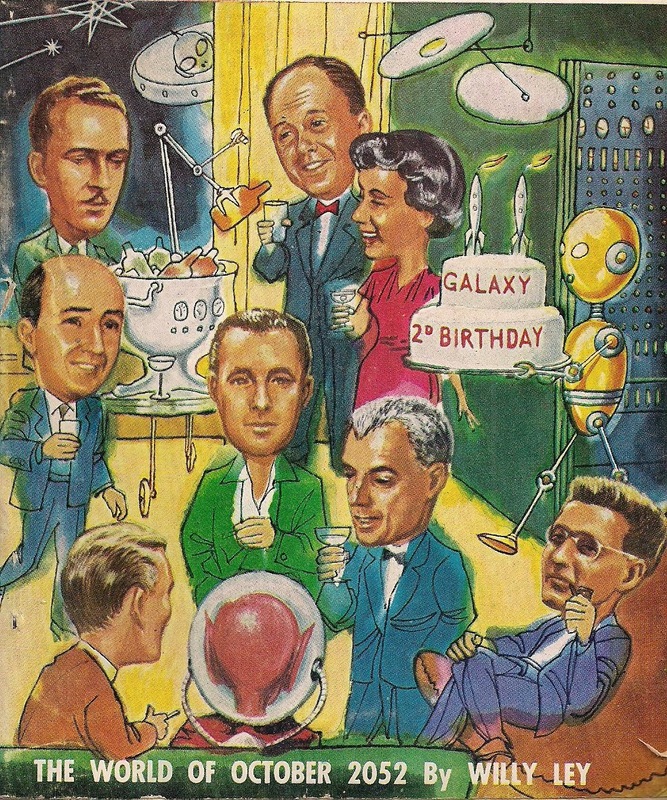 Across the bottom of the panel, from left to right are John Anderson, Galaxy's advertising manager, Bug Eye (in the space helmet), and standing above him in the green suit is a youthful Ray Bradbury, while to Ray's right is the dapper art director W. I. Van der Poel, and reclining meditatively on a chair in the corner, listening intently is Poul Anderson. 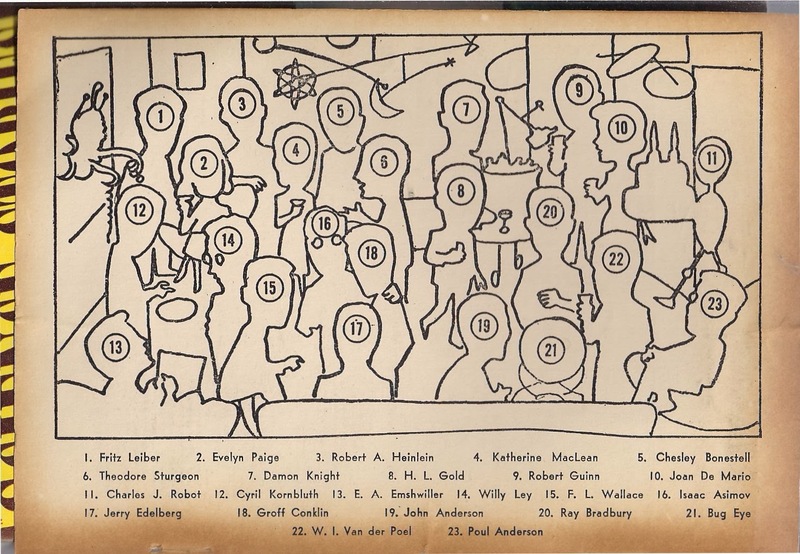 In the lower left corner of th back panel, sketch pad in hand is one of the genre's most able cover painters, Ed Emsh (Emshwiller), looking up at the bespectacled, erudite Willy Ley, the magazine's adroit science columnist as he sketches the proceedings for his cover. 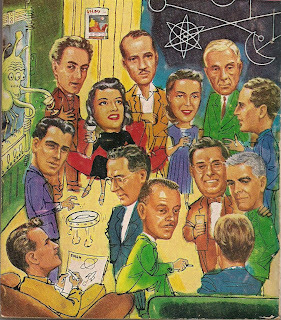 To the right of Emsh, sitting on the chair arm cigarette in hand is author F. L. Wallace, who is listening to a trio of investor Jerry Edelberg (lower right corner), Groff Conklin, the legendary anthologist and most perceptive book reviewer for Galaxy, and with a cup in his hand, a big smile and his arm convivially around Conklin, the young Isaac Asimov. 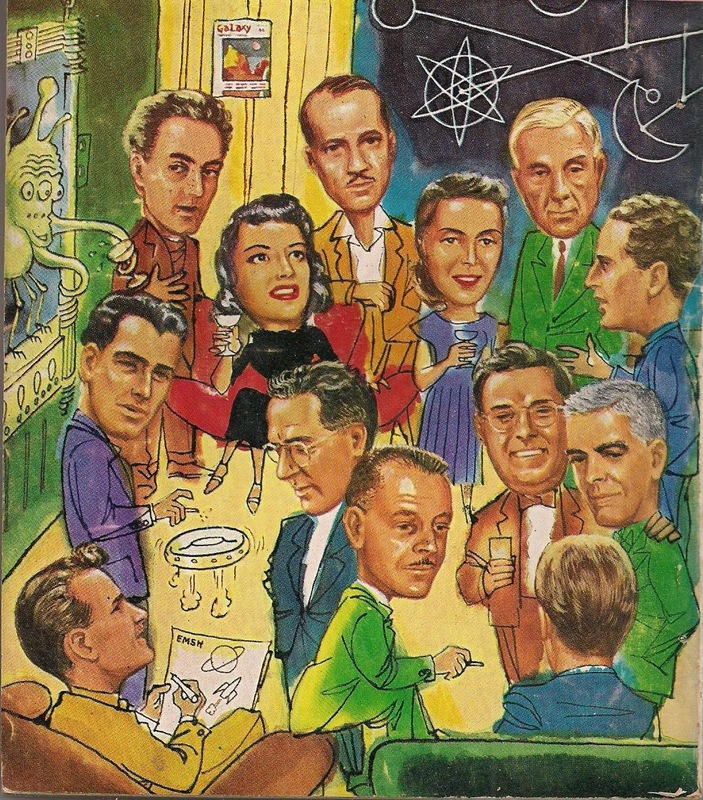 Across the top of the left hand panel, reading from left to right are: the tall, bushy haired Fritz Leiber, a green tentacled alien about to spill a drink on his suit; and sitting next to him in a stunning black dress, the magazine's "assistant" editor; then listening in Robert A. Heinlein, with his signature pencil thin mustache of the era; Katherine MacLean, already a force to be reckoned with, based on her first few stories; white haired and framed by the blackboard is the dean of astronomical artists, Chesley Bonestell, who's work was often featured on the cover; and the curly haired man talking so earnestly to MacLean is none other than Theodore Sturgeon. Here is the original cover key as printed on the inside of the front cover.